I enjoyed playing Battleship as a child. My own children have not played the game yet, but Big Sister (nearly 8) has played a version of the game on paper from a coloring/activity book. In that game, we had to search for animals. When we wanted to play the game again, I told her I would make one for us to play together. So, I changed the theme, provided more directions so as not to confuse her, and created a Little House printable for us...and the Little House Companion readers. It's The Garden Game. Each player plots their garden, planting pumpkins, watermelon, carrots, green beans, and peas. Then the fun begins at each player tries to find their opponent's garden veggies and fruit. The first person to find all of their opponent's garden fruit and vegetables wins. Be sure to print two papers, one for each player. 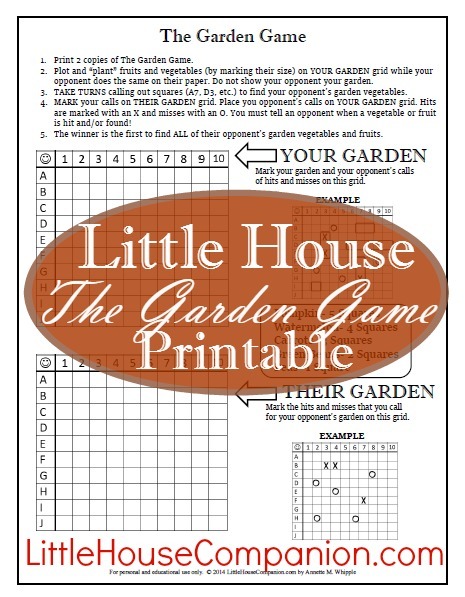 Download The Garden Game Printable. Please leave comment letting me know if you enjoyed our first Little House printable.